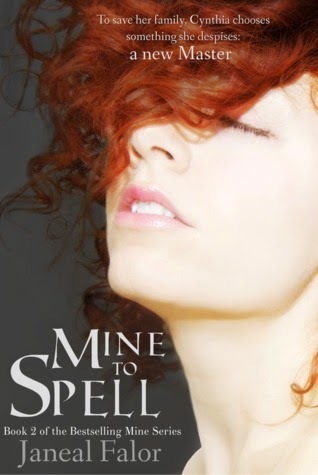 Welcome to my stop on the Mine to Spell blog tour! Today I am excited to share my review, an excerpt from the book, and a giveaway with you all! Janeal Falor has done it again guys! 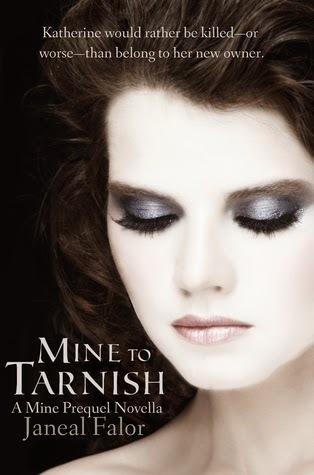 I absolutely loved this second book in the Mine series! Falor has created such an incredible, yet oppressive society of warlocks, magic, and women who must marry and serve a Master. The previous book really sets the stage for change in Chardonia and this book continues to break all the rules of society. While the first book followed Serena, the eldest sister of the warlock Stephen's family, this book follows her sister Cynthia, who has just reached the age to be married and sold to another master. I do not want to spoil the previous book for those who have not read it, but Serena has really shaken up society's rules and expectations of women and now serves as the family's Master. She is not bound to any warlock, but has found her former Master to be Zade, a trust-worthy, loving companion who truly cares for her and her family's safety. With such a huge change always comes repercussions. Cynthia steps up to try and appease society's dismay of what her sister has done and show that Serena is as capable of being the head of the family as any other man. However, in doing so, Cynthia is willingly giving up her freedom, not truly understanding just what she's getting herself into. Even more than that though- Cynthia harbors a great secret- one that is unheard of and could potentially get her killed. I really enjoyed the storyline for this one. I loved where Falor took it and how she showed that even though women may be oppressed in society, they are strong and determined and ready to fight back. Cynthia was a wonderful character to follow and she will do anything to keep her family safe from harm. We get to see plenty of Serena and Zade, which I loved, and while Zade was very stoic in the first book, we really get to see the depth of his feelings for Serena and the lengths he would go to protect her and her family. Waverly, Zade's sister, is also present and is a good friend and mentor to Cynthia. However, the mentor really worth mentioning (because he stole my heart right away) is Lukas. Lukas hails from Chryos, and is in Chardonia for the tournament. He is a good, brave man and as a friend of Zade's he has been tasked to protect Cynthia, as she really stirs the pot and has a lot of angry warlocks after her. I am really glad Falor upped the romance in this novel. Watching Cynthia struggle to work out her feelings for him is quite wonderful. I felt this book was very action packed and we get quite the surprise at the end, which left me with a heavy sense of dread in my heart. I am very nervous about the next installment and what it will mean for Cynthia, Serena, and their family. If you are looking for a good fantasy series- this is the one to pick up! The man who steps in is younger than I expect—mid-twenties perhaps—dark, thick hair, long nose, and a blank expression. Without a word, he sits at the desk. A bit presumptuous, yet I suppose even if Serena has the status of a warlock, it would be hard to change a lifetime of habits. He still hasn’t looked my way. Not that I want him to, but does he even know I’m in the room? Does he care where his soon-to-be property is? What I look like? Who I am? Thomas didn’t want to see Serena before he signed the contract. Perhaps most warlocks are this way. Yet the thought that I made the wrong choice nags at me. “May I introduce you to Cynthia?” Serena must be wondering the same thing. I press my lips together and try not to let his words upset me. What did I expect from a man who barely filled out his paperwork and offered an obscene amount of money? His bid for me was one of the highest: that must have been all he had to offer. Perhaps it’s a good sign. If his conversations are always so short, I won’t be lectured as much. Father always did talk too much. Maybe I’ll be able to find a sort of freedom, not the type I have with Serena, but something in my own way. Amazon best-selling author Janeal Falor lives in Utah with her husband and three children. In her non-writing time she teaches her kids to make silly faces, cooks whatever strikes her fancy, and attempts to cultivate a garden even when half the things she plants die. When it's time for a break she can be found taking a scenic drive with her family, fencing, or drinking hot chocolate. I remembering You Are Mine and wanting to read it! I want to meet these characters and I'm glad you brought the series back to my attention! Great review! Awesome Review Jess! This sounds like a great book! It would be horrible to live in such an oppressive world where as a woman you were expected to serves a man, your master! I love books that have magic, and are action packed. The main characters sound wonderful as well!